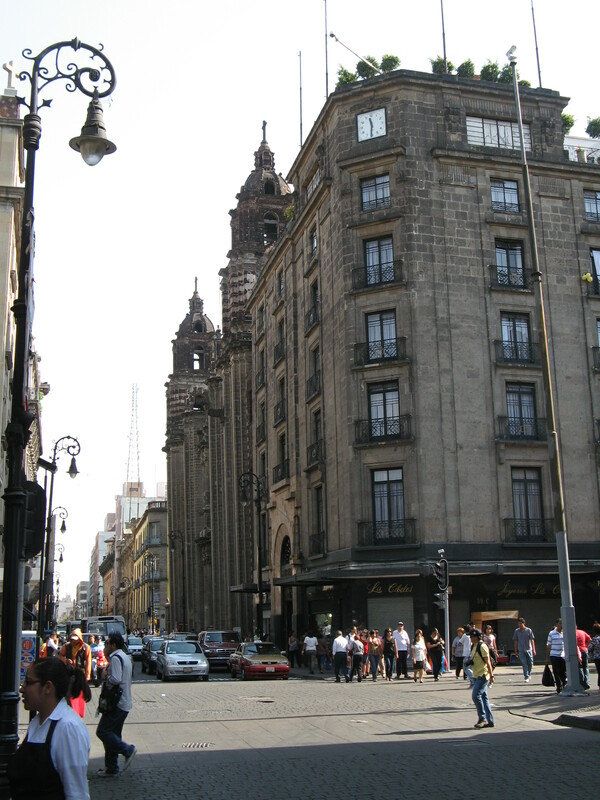 Our fifth full day in Mexico City, Wednesday, was May 5. For whatever reason, Cinco de Mayo has become the day to celebrate Mexican culture in California. In most of Mexico, while it’s significant enough to be a federal holiday and have a downtown street named after it, May 5 is not a big deal. There was a parade on Saturday morning, we didn’t know why, so maybe the occasion was “closest Saturday to May 5th”? Quien sabe. In any case, we were glad that Cinco de Mayo isn’t considered an occasion for 2 a.m. fireworks*, because we’d switched hotels and were now right downtown, two blocks from the Zócalo. 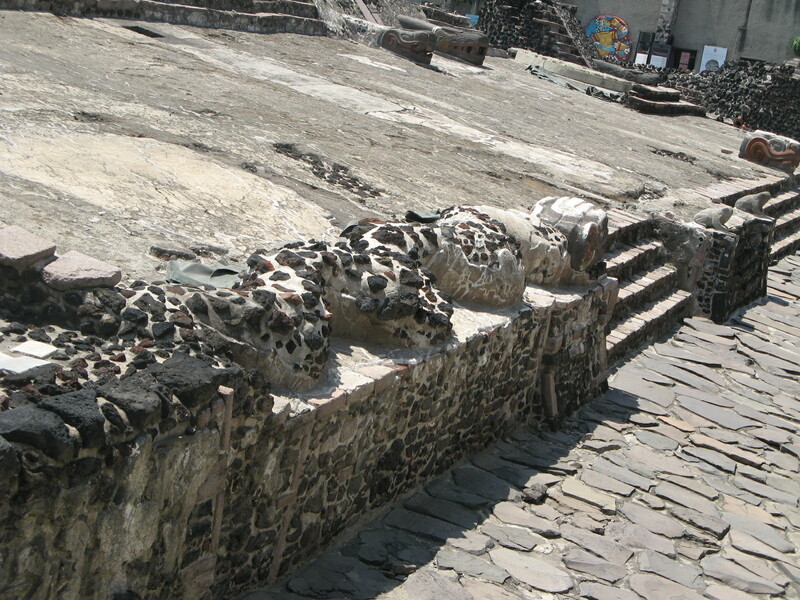 The Aztec temple, known as Templo Mayor, was uncovered by a 20th century work crew. 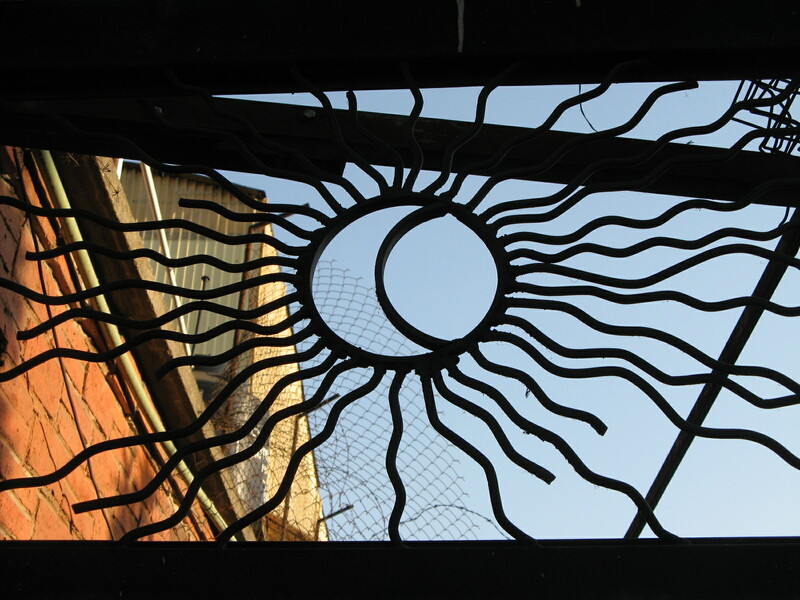 As I wrote the other day, I was moved by this remnant within the modern city. However, I was also hot and worn out from dealing with a very grumpy child. I think she was letting us know in the only way she knew how that she’d been away from her routine for too many days and dragged to altogether too many adult-type activities, such as Looking at Things. Sorry, sweetie. We’ll make the next trip shorter. So my attention span was also not very long, but I really liked these frogs and the way they look like they’re about to be eaten by the giant snakes (the counterpart to the giant snake in the foreground being out of the frame, on the far side of the frogs). 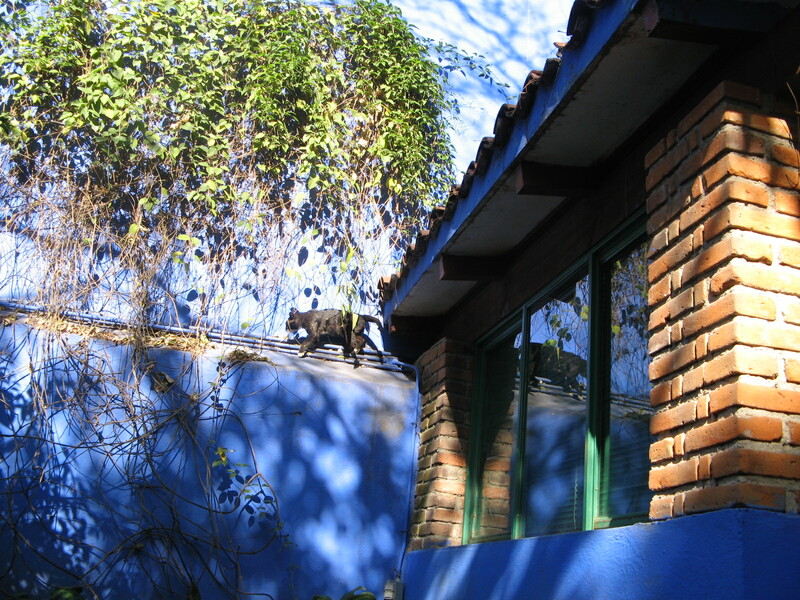 Then we had lunch and went to the Blue House. I should’ve known there would be cats there (photo by the munchkin!). Rivera and Kahlo are two interesting artists even without the soap-opera excitements of their lives to spice up the work. But being there, where they lived, the drama within the work is particularly hard to separate from the drama swirling around it. 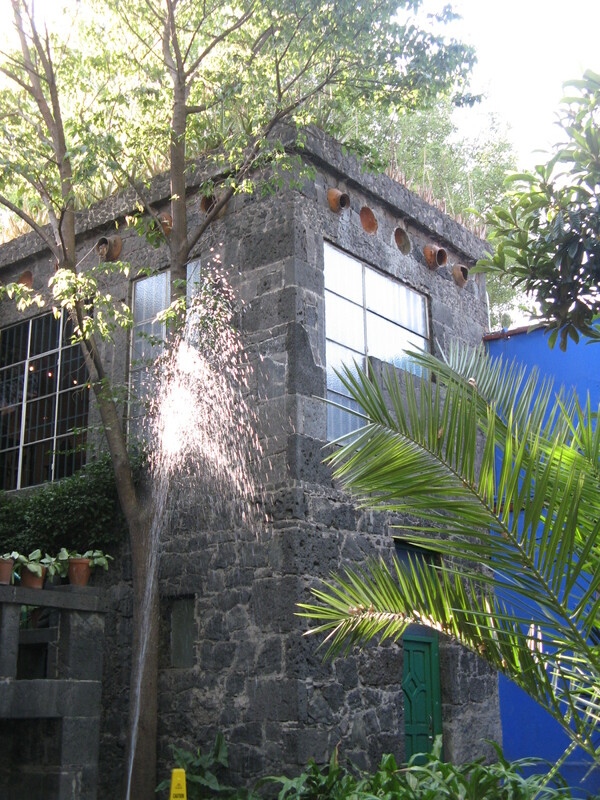 Kahlo’s studio is a testimony to a life of pain (wheelchair and the easel made to be reachable from it), loss (medical poster of the stages of fetal development, which she presumably used in the paintings about her miscarriages and trauma-induced infertility), controversy (a box on her bookshelf is labeled “Protest Rockefeller Vandalism”), and love (another box bears the lotería symbol of a heart, and contains letters from Diego). And I admit that the piece that most captured my attention was a little drawing called “Ruin” that sure looked like a “screw you” letter, addressed “para Diego.” It showed a bust of Frida as a crumbling ruin, and was accompanied by a kind of poem: “Casa para aves, nida para amor, toda para nada” (“House for birds, nest for love, all for nothing”). Ouch. Whatever was going on in February 1947, several years into their second marriage to each other, it wasn’t making her happy. The grounds are beautiful, with a pyramid (? ), ponds and fountains, lots of sculptures, and of course those cats, altogether making it a great place for a little one to hang out. We spent a long time there. 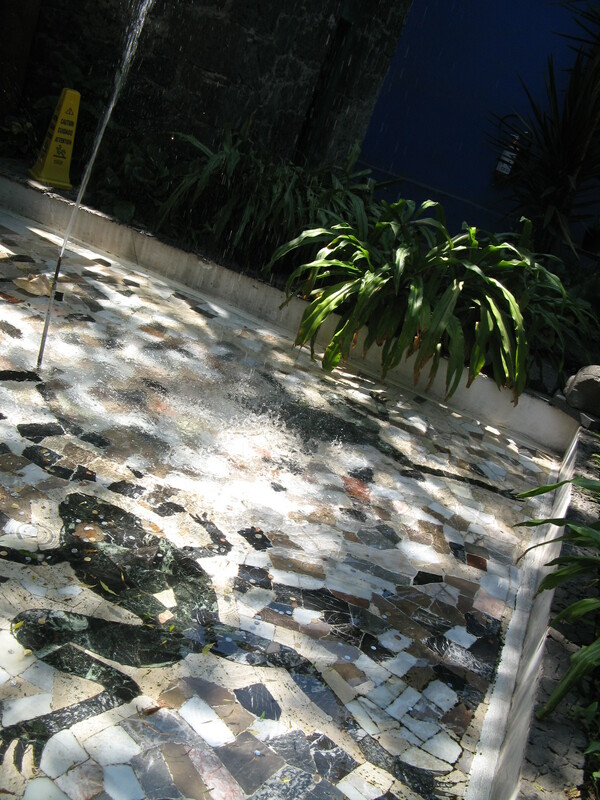 I liked the frog mosaic in the fountain. Maybe it was an in-joke of Rivera’s, who was fully aware that he looked like a frog (and was irresistible to women anyway). *At least, not in Mexico City. 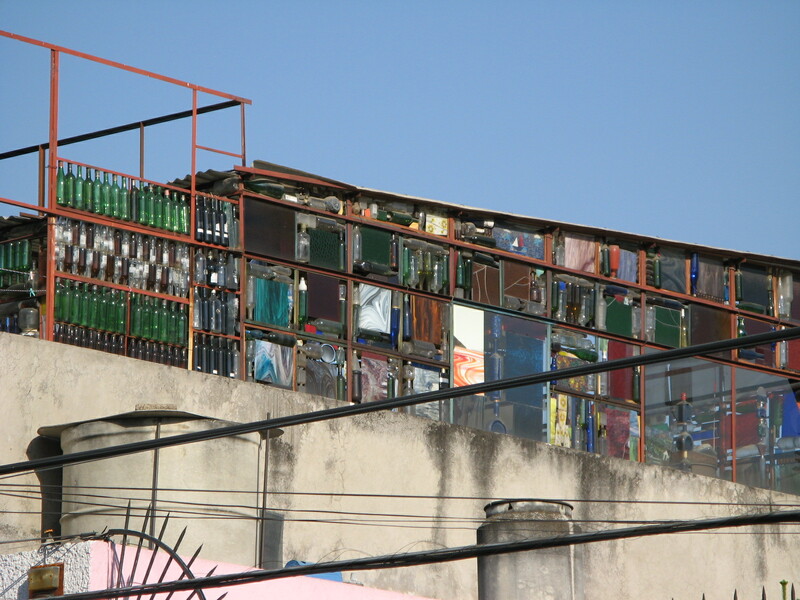 San Miguel, which never passes up an excuse to make a great deal of mess and noise,** probably partied all night. **Fifty points to your house if you know whom I’m quoting.